In a column that appeared in the Chicago Sun-Times, Jesse Jackson called for a United Nations investigation into the racial context behind the death of Trayvon Martin. If Trayvon Martin were not a young black male, he would be alive today. Despite the verdict, it’s clear that George Zimmerman would never have confronted a young white man wearing a hoodie. He would, at the very least, have listened to the cops and stayed back. Trayvon Martin is dead because Zimmerman believed that “these guys always get away” and chose not to wait for the police. I do not know if the Rev. Jackson is ignorant of the actual events of the shooting or if he is a liar. Considering his past history of using real or imaginary racial grievances to extort corporations and enrich himself, I am going to go with liar. The truth is that Martin’s skin color was irrelevant to the question of whether he would have died that night. Here is the transcript of the 911 call that George Zimmerman made. Hey we’ve had some break-ins in my neighborhood, and there’s a real suspicious guy, uh, it’s Retreat View Circle, um, the best address I can give you is 111 Retreat View Circle. This guy looks like he’s up to no good, or he’s on drugs or something. It’s raining and he’s just walking around, looking about. OK, and this guy is he white, black, or hispanic? Yeah. A dark hoodie, like a grey hoodie, and either jeans or sweatpants and white tennis shoes. He’s here now, he was just staring. looking at all the houses. Now he’s just staring at me. OK-you said it’s 1111 Retreat View? Or 111? That’s the clubhouse, do you know what the-he’s near the clubhouse right now? Yeah, now he’s coming towards me. He’s got his hand in his waistband. And he’s a black male. How old would you say he looks? He’s got button on his shirt, late teens. Somethings wrong with him. Yup, he’s coming to check me out, he’s got something in his hands, I don’t know what his deal is. Just let me know if he does anything, ok? (unclear) See if you can get an officer over here. Yeah we’ve got someone on the way, just let me know if this guy does anything else. Okay. These (expletive) they always get away. Yep. When you come to the clubhouse you come straight in and make a left. Actually you would go past the clubhouse. So it’s on the lefthand side from the clubhouse? No you go in straight through the entrance and then you make a left, uh, you go straight in, don’t turn, and make a left. (expletive) he’s running. He’s running? Which way is he running? Ambient sounds are heard which may be Zimmerman unbuckling his seat belt and his vehicle’s “open door” chime sounding. The change in his voice and the sound of wind against his cell phone mic indicate that he has left his vehicle and is now walking. The dispatcher seems to pick up on these changes and sounds concerned when he later asks Zimmerman if he is following Martin. Down towards the other entrance to the neighborhood. Which entrance is that that he’s heading towards? This section of the recording has been the subject of much speculation. Some suggest that Zimmerman has just made a racial slur, but the audio is not clear. Ok, we don’t need you to do that. Alright sir what is your name? Alright George what’s your last name? And George what’s the phone number you’re calling from? Alright George we do have them on the way. Do you want to meet with the officer when they get out there? Alright, where you going to meet with them at? What address are you parked in front of? I don’t know, it’s a cut through so I don’t know the address. Okay do you live in the area? It’s a home it’s [house number removed], (knocking sound) oh crap I don’t want to give it all out, I don’t know where this kid is. Okay do you want to just meet with them right near the mailboxes then? Alright George, I’ll let them know to meet you around there, okay? Actually could you have them, could you have them call me and I’ll tell them where I’m at? Okay, yeah that’s no problem. Should I give you my number or you got it? Okay no problem, I’ll let them know to call you when you’re in the area. Notice that Mr. Zimmerman did not identify Martin by race until the dispatcher asked him. Even then he seemed not to be certain at first. Perhaps the hoodie that Martin was wearing and the darkness made it difficult to be sure of his race. Notice that Zimmerman stated that the individual was acting in a suspicious manner, “on drugs or something”. It is clear that Zimmerman was not just following the first Black person he happened to see, nor did Martin appear to be just walking home. It took me about 3 seconds to find this transcript via Google. What is Jackson’s excuse? Let’s go on. What it dramatizes is what Michelle Alexander calls “the New Jim Crow.” Segregation is illegal; scurrilous racism unacceptable. But mass incarceration and a racially biased criminal justice system have served many of the same functions. Since 1970, we’ve witnessed a 600 percent increase in the number of people behind bars, overwhelmingly due to the war on drugs. Those imprisoned are disproportionately African Americans. The U.S. now imprisons a greater percentage of its black population than South Africa did at the height of apartheid. Why are so many young Black men in prison? Why are Black men more likely to be profiled? Black men are responsible for a disproportionate amount of the crime that occurs in the United States. It actually makes sense to profile Black men, even if the great majority of Blacks profiled are innocent of any crime. This is a deplorable situation, even if overall crime rates have been dropping in recent decades. This situation will not be resolved as long as influential people in the Black community insist on blaming “whitey” for all of their woes. We need to ask serious questions about why so many young Black men are attracted to criminal behavior. Until that happens the prison will continue to be filled with young Black men and young Black men will continue to be killed in self defense. 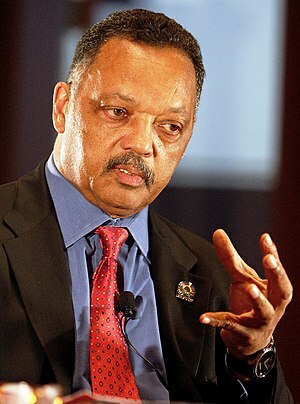 The sad thing is that Jesse Jackson does seem to have some idea of what is going wrong. The results are devastating. Young fathers are jailed. Children grow up in broken homes, in severe poverty, since those convicted never really leave prison. They face discrimination in employment, in housing, in the right to vote, in educational opportunities, in food stamps and public support. As Alexander argues, the U.S. hasn’t ended the racial caste system, it has redesigned it. It is not just that young fathers are jailed. The public support that Jackson claims discriminates against Blacks tends to make young father superfluous. This might be part of the reason that around 70% of Black babies are born to a single mother. This high rate of illegitimacy has proven to be absolutely devastating. I suspect that the Black family was stronger during Jim Crow and even slavery than it is now. What is Jackson doing about this? Blaming others. We need a national investigation of the racial context that led to Trayvon Martin’s slaying. Congress must act. And it’s time to call on the United Nations Human Rights Commission for an in-depth investigation of whether the U.S. is upholding its obligations under international human rights laws and treaties. Trayvon Martin’s death demands much more than a jury’s verdict on George Zimmerman. It calls for us to hear the evidence and render a verdict on the racial reality that never had its day in court at the trial. Or we could have an honest conversation about the causes of the problems that beset the Black community. We could teach young Black men to takes responsibility for themselves and not blame racism for every setback. But then, a community of confident achievers would have no use for the likes of Jesse Jackson. He is not and never will be part of the solution. He profits too much from the problem. He is a parasite, living off the misery of others.